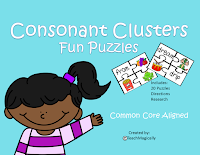 Once students have learned all the consonants, you should teach and practice the consonant clusters! What are consonant clusters you ask? And how do they differ from blends? Consonant cluster is the name given to two or three consonants that appear together in a word. Each consonant retains its sound when blended. The term cluster refers to the written form, and the term blend refers to the spoken form. So you can combine phonics and phonemic awareness seamlessly! These need to be taught and practiced with beginning readers to help them learn to blend words and not forget some of the letters! Once you teach the process to the students, these puzzles can be used in centers to help the students better develop this skill!